Hydroxypropyl Methylcellulose, Dicalcium Phosphate, Corn Starch, Microcrystalline Cellulose, Hydroxypropyl Cellulose, Magnesium Stearate, Silicon Dioxide. Take 2 tablets up to to four times per day. Aim to consume at least 3.2-6.4 grams of CarnoSyn® total per day. Consult your physician prior to using this product if you are pregnant, nursing, under 18 years of age, take medication or have a medical condition. Immediately discontinue use and contact your physician if any adverse reactions occur. Keep out of reach of children. Store in a cool, dry place, avoid direct sunlight, humidity and high temperatures. Replace lid securely after each use. Kaged Muscle SR CarnoSyn is one of the most exciting breakthroughs in the science of delivering muscle performance. 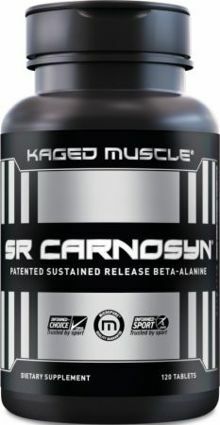 Scientists have known for years that beta-alanine provides athletes with performance enhancement, however, SR CarnoSyn has taken things to the next level. SR CarnoSyn delivers a sustained release of beta-alanine into the body for hours. As a result, that means you get beta-alanine transported into muscle cells to produce carnosine with sustained supply in your bloodstream, which stays in your body longer compared to instant release beta-alanine, without reaching the typical paresthesia-sensation (itchy, tingly skin feeling).